The fall of the enclave Srebrenica is commemorated in a number of places around the world annually, on July 11th. In the Netherlands as well. There the National Srebrenica commemoration takes place on Het Plein, in the centre of The Hague, among the buildings of the Parliament and of the Ministry of Defence. A moveable monument was made for that purpose in 2000, commissioned by the Political Committee Stari Most; annually, on July 11th, it is erected on Het Plein. 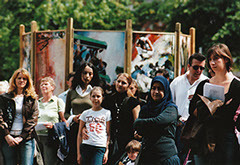 The monument consists of 10 panels of composite pictures of the events on and around July 11th 1995 and of their aftermath. Each panel is 3 metres high. The panels are mounted on poles and placed in a circle, in the middle of Het Plein.